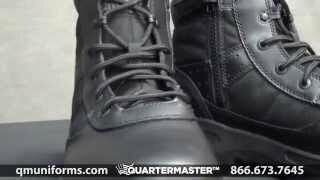 The Dispatch 2.0 series prove that you don’t need to pay a lot forthe comfort and quality you expect from your duty footwear. Inspired by athletic footwear technology with comfort and durability in mind. 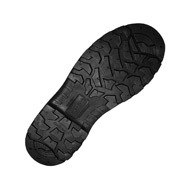 The most durable and comfortable boots LawPro has ever built. Bought August 21st. Today (November 26th) one of the zipper tabs snapped off. Had to replace it with a key ring. These also don't have much arch support at all. I bought my first pair in October 2015. They lasted until near the end of 2017 when I retired them. I should have immediately bought another pair, I LOVED them. But NO, I went to a cheap box store and have paid the price since in sore feet, scrunched up toes and painful knees. Never again will I make that same mistake twice. These boots wear well for my line of work and comfort is a MUST. I'll pay the extra dollars just for this alone. This is now my second purchase of this boot. I'm sure there will be a third, fourth, fifth, etc. until I retire. The first pair fell apart within 3 months. Quartermaster replaced them with no problem and the second pair I’d just as bad. My son had a pair of boots from Kmart that he wore every day for 3 years! The only reason we threw them out was because he finally grew out of them. These only lasted 3 months! Going to get another replacement, but not this boot again!! I bought a pair of these maybe a year ago or so. I liked them and was impressed how comfortable they felt. I've worn them down, used them daily for about 4 of 5 months. No true complaints, being former Military, the only thing was they didn't take a good shine but the shine was enough to pass briefing inspection. I want to order the 8" version of these boots. Still breaking in the shoe. Noticed shoe is a bit tight on size. If you do order consider a half size larger. Feels bulky yet. Still unsure of the purpose of having a size zipper. I have to say that I was worried about two things. 1. If it would fit me and 2. If it was going to be good quality. But it fit perfectly and it's very good quality for a decent price. It' feels so good that I also use these shoes for running. 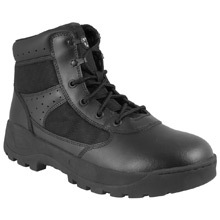 First rate boot, Reasonable price, great bang for the buck. Well made, great features. Law Pro will be my next boots. This shoe is comfortable and supportable. Killed my pair is less than two months , were comfy for about three weeks and then started to break down. if you foot patrol a great deal, pass on these." You get what you pay for. " Im a Security Officer who works in a Indian Casino. Im on my feet a lot. I bought these boots about three years ago and I wish I had not. They do not hold up. I have had to have them repaired twice. Now the sole is seperating on on of them. I would not be writing this, if I had done something to cause the boots to fall apart. I do a lot of walking in my job, that is all. That is enough. I do not recamend anyone buying these boots. In this case, I got what I paid for and I'am sorry for it. I will never again purchase expensive brand name boots! I had ordered a pair of Blauer boots previously! The dial/wire lace tigner fell off never to be seen again! $100 some odd dollars wasted! I ordered these Law Pro boots after my refund! Just Great Boots! No fancy pants stuff! I've had my 1st pair for over a year. It is time to replace them & I came to get the same ones ... 'nuff said! I was really surprised how well they fit. A vey well made shoe that beats the higher priced shoes hands down. I work 10 - 12 hour tours mostly walking and standing and they are passing the test of time. An excellent shoe for a good price. Great boot so far. I've only had them for a few weeks, but they are very comfortable right out of the box! Love them already! I decided to save money and go with these. What a great idea. These are far better than expected. I have problem feet and cannot buy mailorder, but I did this time and I am glad I did. The comfort is like the big name brands that I have tried on in stores. It took just a few walks to soften then up too. Overall construction seems to be quite good. I have a wide toe area with very narrow heels, high arches and heel spurs, and I would buy these again!!! Q: are these boots polishable? Q: "Is this boot ""metal detector friendly?"" I work in corrections and would rather not be hasseled with removing my boots everyday to clean the gate." A: These have a metal shank so they are not metal detector friendly. Q: Do these boots run true to size? A: Lawpro boots tend to run a little bigger than normal. Q: Is this boot made in the USA? A: No this is not manufactured in the U.S.
Q: Is this shoe waterproof? I don't see anything about that listed. I just ordered 2 pairs, but I was just wondering. A: "The LawPro 6"" Dispatch Duty 2.0 Side-Zip Boot are not waterproof."